OKARCHE, OKLAHOMA. (AP, SEPTEMBER 23, 2017) — The Latest on a beatification mass starts for 1st US martyr (all times local): 11:40 a.m. The Roman Catholic Church's first U.S.-born martyr has been beatified, bringing the Oklahoma native a step closer to possible sainthood. A letter from Pope Francis declaring the Rev. 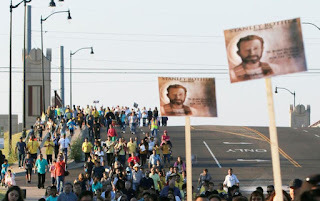 Stanley Rother (ROW-THUR) as blessed was read at a Mass in Oklahoma City, completing the beatification process. Rother was born in Okarche, Oklahoma, and died in 1981. He was one of several Catholic priests who were killed during the civil war in Guatemala. Francis declared Rother a martyr in December. This is only the second beatification held in the United States. 10:10 a.m. The Catholic Mass is underway to beatify an Oklahoma-born priest killed during Guatemala's civil war. The Rev. Stanley Rother (ROW-THUR) was born in Okarche, Oklahoma, and died in 1981. He was one of several Roman Catholic priests who were killed in the war. Choirs sang hymns in English and Spanish as thousands crowded into an Oklahoma convention center Saturday for the ceremony. The church asked parishioners not to save seats as lines wrapped around the outside of the building. Some people were turned away. Pope Francis declared Rother a martyr in December. Beatification is a step toward potential sainthood. This is only the second beatification held in the United States. 12:11 a.m. An American priest killed during Guatemala's civil war is set to be beatified in his home state of Oklahoma, and he's on the path to possible sainthood. 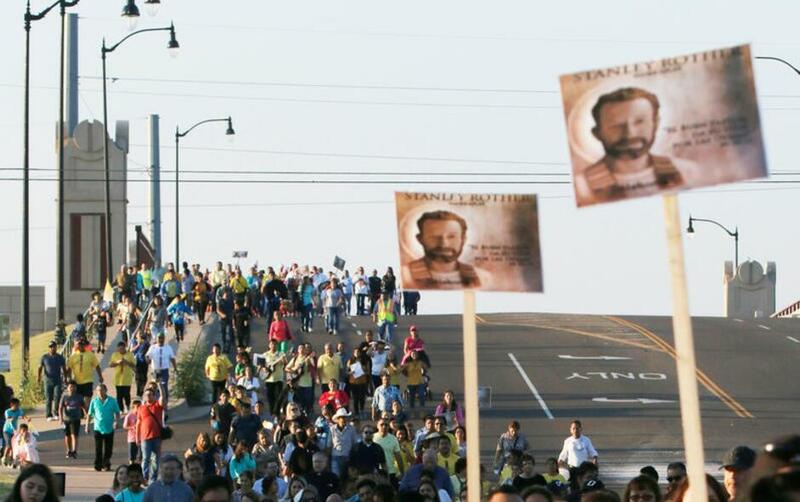 Thousands of people are expected to attend a beatification mass Saturday for the Rev. Stanley Rother (ROW-THUR) in Oklahoma City. Pope Francis declared Rother the first U.S.-born martyr in December. Rother was born in Okarche, Oklahoma. He died in 1981, one of several Roman Catholic priests slain during the war. Francis, the first Latin American pope, has said priests killed during region's right-wing dictatorships died out of hatred for their faith. Regular candidates for beatification need a Vatican-certified miracle attributed to their intercession, but the church has made an exception for martyrs. A miracle is still necessary to be declared a saint.